The 19th century saw a rapid growth in the communication industry and the first electric telegraph for public use was introduced in England in 1838. In America in the same year, Samuel Finley Breese Morse (1791-1872), demonstrated his Morse code where various combinations of short and long signals – dots and dashes – represent different letters of the alphabet and numbers. As electric telegraph transmitted on-off signals at varying lengths, Morse code was ideal for sending telegraph messages. At about the same time Morse introduced the relay, an electrically operated switch by which a signal sent along the wire was strengthened at intervals, making long distant communication possible. Submarine cables, for commercial use to transmit telegraph messages, were laid between the South Foreland at St Margaret’s Bay – east of Dover – and Cap Gris Nez, France in September 1851 and across the Atlantic in 1868. Alexander Graham Bell (1847-1922) and Elisha Gray (1835-1901) invented telephones, separately. Both filed their patents on the same day – 14 February 1876 – but as Bell arrived first he was given universal credit. The following year Thomas Edison (1847-1931) developed his variable-resistance carbon transmitter and the modern telephone was born. Like the telegraph, the telephone needed wires for communication but these were expensive to lay down and easily broken. Between 1886 and 1889, Heinrich Hertz (1857-1894), demonstrated the existence of radio waves by, in essence, generating electricity in a circuit between two terminals held slightly apart. He discovered that the electricity would jump from one to the other in the form of a spark. At the same time, about 12 metres (40 feet) away he placed a second, identical circuit and every time Hertz made the spark jump across the first circuit’s terminals an identical spark jumped across the terminals of the second circuit. He found that the first spark had generated electromagnetic radiation or radio waves that were picked up by the second circuit, as it was sensitive, or tuned, to the first circuit’s frequency. Thus, Professor Hertz had proved the existence of airborne electromagnetic waves, at the time called Hertz Waves. William Preece (1834-1913) – later knighted – was an inventor and the consulting engineer for the General Post Office (GPO), in the 1870s and was developing Professor Hertz’s observations. In 1889, Preece managed to transmit radio signals, using low frequency electromagnetic waves, over a distance of a mile. Seven years later, in 1896 he tried to establish wireless communication, using low frequency electromagnetic waves, between South Sands Lightship (later East Goodwin Lightship) – in the Strait of Dover – and South Foreland, near St Margaret’s. At the bottom of the sea, a cable was coiled in a ring about the size of the area that the Lightship swung with each change of the tide. Another cable was then coiled around the Lightship above the waterline. Preece’s system actually used a mixture of induction and conduction waves. High frequency electromagnetic waves transmitted through the air were not considered a viable solution due to their perceived lack of range and the screening effect of the seawater and the iron hull of the Lightship. However, in 1897, using low frequency electromagnetic waves, communication was established between Sark and the other Channel Islands. It was beginning to look as if electromagnetic waves could be used to send wireless messages but only over short distances and not to ships. The perceived opinion was that there was no such thing as practical wireless telegraphy and that all long distance transmissions had to be carried by wires. Nonetheless, Preece took a young Italian inventor Gugliemo Marconi (1874-1937) under his wing. On 2 June 1896, Marconi gained a British Patent for his wireless invention and the following year, using high frequency electromagnetic waves, Marconi sent a signal three miles across Salisbury Plain. This was followed by another experiment when the distance was increased to 9 and then 32 miles. Despite Preece being one of Marconi’s earliest supporters, the creation of Marconi’s Wireless Telegraph Company in July 1897 meant that the Post Office now saw Marconi as a potential competitor and a serious challenge to their monopoly in the realm of public telegraph services. At the instruction of the Secretary of the Post office the General Post Office (GPO) officially suspended all support for the young inventor and his new commercial venture. While he was on sick leave at his home in Caernarfon, Preece learnt that the GPO and the War office has agreed to collaborate in a series of secret wireless system trials using Marconi’s equipment at Fort Burgoyne, near Dover, but did not invite Marconi. The GPO even planned to attempt a wireless transmission across the English Channel. Assisted by soldiers of the Royal Engineers using a horse-drawn trolley, their transmitting apparatus was transported to the site and to receivers that were set up at two different sites. 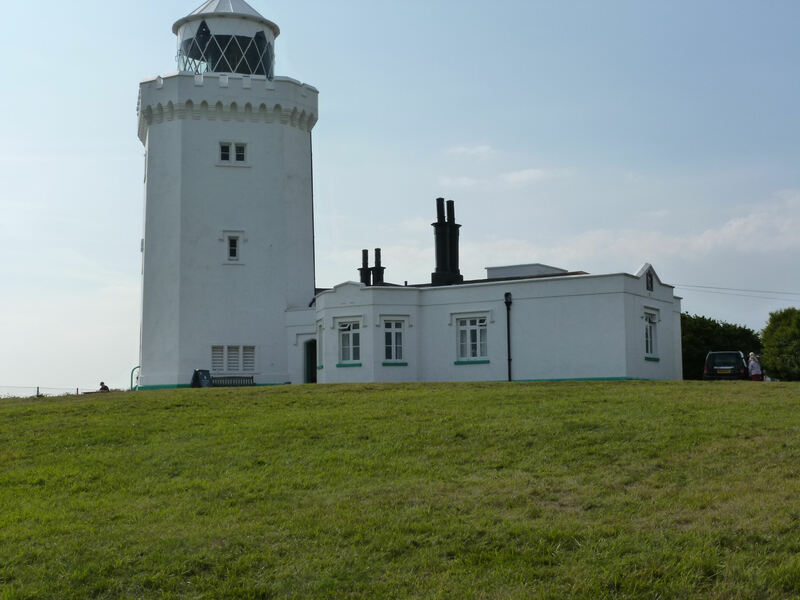 The first receiver site was on Swingate Down, to the east of the Castle, and the second at the South Foreland upper Lighthouse. Both receiving stations had an aerial suspended between two masts. The accumulators (batteries) used in the experiments were charged daily at Dover Electricity Works in Park Street. The induction coil was so powerful that it produced a thick spark about 1 yard (1 metre) long and the messages were transmitted from a vertical wire carried up a tall pole. To reach the receiver at St Margaret’s, a kite composed of thin copper was erected at the top of the transmitting pole. It was locally said that the messages were easy to read at both the receiving stations. A hut had been erected at South Foreland upper Lighthouse for the apparatus. Having completed the Dover trials, the GPO suspended all further wireless experiments and in November 1897, the Marconi Wireless and Telegraph Signal Company was officially registered. The new company was told by the GPO that they considered that wireless telegraphy, ‘Could scarcely yet be regarded as having reached a practical state.’ Marconi disagreed and by 1898 he had built the world’s first permanent wireless station on the Isle of Wight and in December that year Marconi opened the world’s first wireless factory in Chelmsford, Essex. Soon after Trinity House asked Marconi if he could connect South Sands Lightship, some 12 miles from from the South Foreland, with the mainland. On Monday 19th December 1898 Marconi began trials from a hut erected besides the South Foreland upper lighthouse and on Christmas Eve he transmitted a signal to the Lightship. This was the world’s first shore to ship radio transmission. The trials were due to officially end on Monday 9 January 1899, but the South Foreland lighthouse wireless station stayed in operation for nearly a year. A bell was installed that was activated by wireless transmission to alert the lighthouse keeper of messages arriving. On Monday 26 March Marconi built a wireless station across the Channel adjacent to Wimereux lighthouse, near Boulogne, France. On the following day he made the first ever wireless transmission across the English Channel and the messages exchanged were the first ever international wireless messages. In April 1899, by using the three stations on the South Sands Lightship, South Foreland and Wimereux, Marconi’s experiments with ‘syntonic’ tuning had made sufficient progress so that South Foreland was able to communicate with the Lightship without a single dot being received by Wimereux. In the hut adjacent to the lighthouse, Marconi continued to work on improving his system and in April 1899, he met representatives from Trinity House that included their scientific adviser, John William Strutt, 3rd Baron Rayleigh (1842-1919) and Captain the hon. Vereker of the Board of Trade. Marconi showed the distinguished party his equipment that included the aerial, which was the lighthouse flagstaff with a 150-foot wire running up it and terminating in the air like a lightning conductor. 30 miles across the Channel at Wimereux lighthouse, he told his distinguished guests, was a transmitter and receiver operated by one of his assistants. Marconi then demonstrated wireless communication showing that each transmission’s communication took less then 10 seconds to reach the destinations. The Trinity House yacht Vestal took Marconi and the rest of the party to the South Sands Lightship, and there Marconi showed his apparatus. On return he successfully demonstrated the first practical shore to ship and ship to shore wireless communicating system. He explained about the alarm bell adapted to arouse the lighthouse keeper of incoming messages from the Lightship. 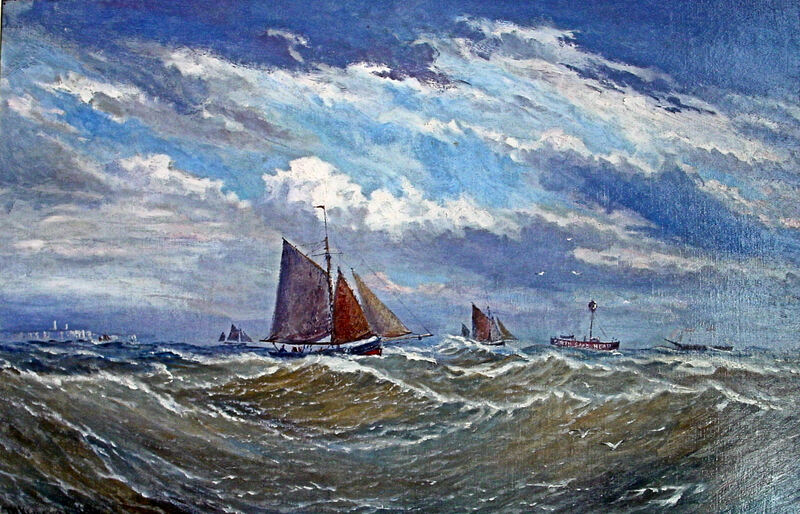 Telling them, that on receipt of messages, the lighthouse keeper communicated, by telephone, to the relevant authorities if a ship was in danger and lifeboats at Dover, Walmer, Deal and Ramsgate were quickly summoned. On Sunday 11 March 1899 the first ever call for assistance and report of an accident at sea was made by wireless for the sailing ship Elbe from the South Sands Lightship. Marconi’s wireless system had instigated the first ship to shore message, the first shipwreck rescue, first use of the international distress signal and undertook the first international transmissions to France across the English Channel. He established the first use of wireless in the air and after extensive trials with the Royal Navy he sent his fragile new system to face the harsh environment and demands of the military during the Boer war for the first time. Further, before the officials returned to London the French authorities had informed Marconi, by wireless communication from Wimereux, that they were interested setting up a transmission terminal at the Eiffel Tower, Paris. Later that April, on board the French gunboat, Ibis, and using the ship’s mast, Marconi demonstrated to the French authorities that it was possible to send clear messages four ways. Between the ship, South Foreland Lighthouse, South Sands Lightship and Wimereux. Over the following few days, Marconi carried out a number of experiments and successfully demonstrated that weather conditions did not affect transmissions. However, moving the ship increasing distances from the other three transmitters showed that the distance a message could be sent depended on the height of the transmission pole. Marconi worked on resolving this problem and in September 1899, the British Association for the Advancement of Science conference was held in Dover. One of the many distinguished speakers was Dr John Ambrose Fleming (1849-1945), Professor of Electrical Technology at University College in London. His subject was ‘A Centenary of the Electrical Current’ commemorating the discoveries of the Italian physicist Alessandro Volta (1745-1827), who is credited with the invention of the battery in 1800. The Professor had been appointed technical consultant to the Marconi Company and as Marconi’s apparatus was, by this time, a permanent fixture in the huts at South Foreland and Wimereux a demonstration was in order. At the time Marconi was leaving for America but was happy with the proposal. Apparatus was set up in the Connaught Hall within the Maison Dieu – then the Town Hall – and an aerial pole was erected on the Maison Dieu tower – the top was 140-feet from the ground. This was to be a routine communication with the South Foreland station only four miles away. 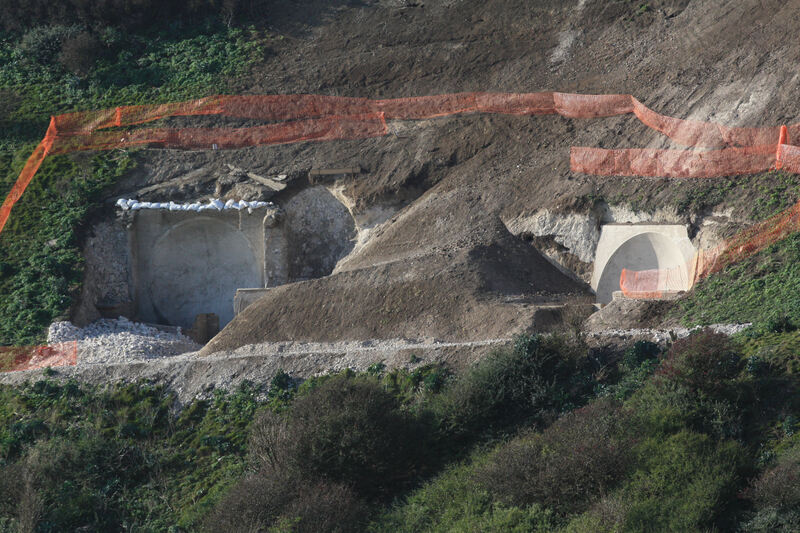 However, between is the 400-foot cliff upon which Dover Castle stands and therefore the demonstration had a serious purpose, proving to the members of the Learned Society that wireless waves would reach their destination regardless of the intervening obstacle. At the time the Association Francaise pour l’Avancement des Sciences and the Société Geologique de Belge were meeting at Boulogne during the same week as the British Association convened at Dover. So an experiment in cross Channel communication by wireless telegraphy from the centre of Dover to nearby Wimereux was scheduled. Further, a telegraphy connection had been planned between Wimereux and Como, Italy, the birthplace of Volta. There, an Electrical Congress was being held so could be informed of the outcome. Dover’s Mayor William Crundall, accompanied by Sir William Poland, Recorder of Dover, George Wyndham – Dover’s MP 1889-1913, and other dignitaries, came to see the experiment. The Mayor, on his visit, sent a wireless message to Wimereux. At the time there was a thunderstorm in the Channel but this did not appear to effect the communication is any way. The experiment from Dover Town Hall had proved to the scientific establishment that wireless waves could reach their destination regardless of intervening obstacles. Alfred Willis, the general manager of South Eastern Railway Company, in January 1900, announced that Marconi’s wireless was being installed on all the Company’s cross Channel ships so that the ships would be in contact with both the English and French bases all the time. Passengers, however, would not be allowed to use the service. The first ship on the Belgium Marine Ostend passage to be fitted with wireless communication was the Princess Clementine, a fast steel paddle steamer built in 1896. The system was installed in May 1900 and in November that year she maintained communication throughout a crossing during a force 8-9 gale. 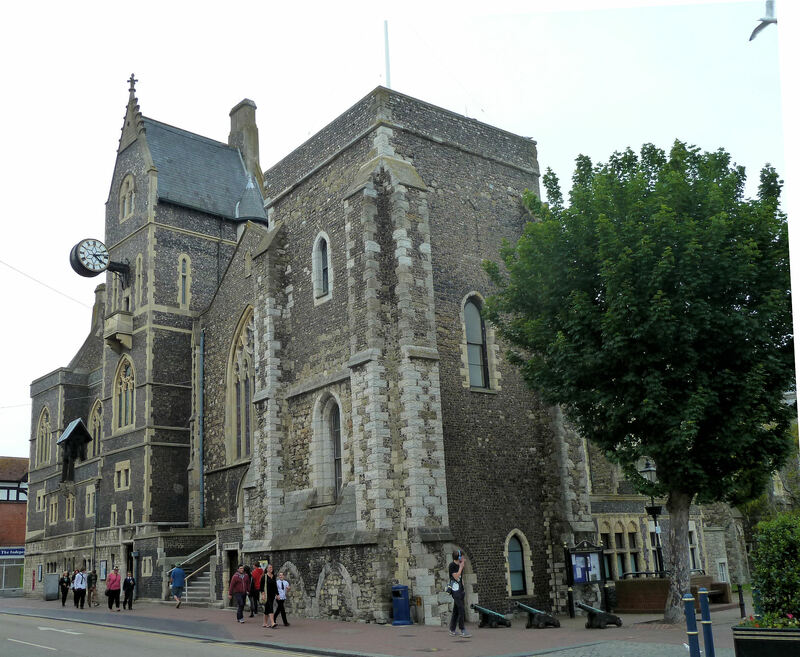 That year, Dover was selected as one of the bases for a Royal Navy wireless telegraph station that was set up in the Citadel on Western Heights. 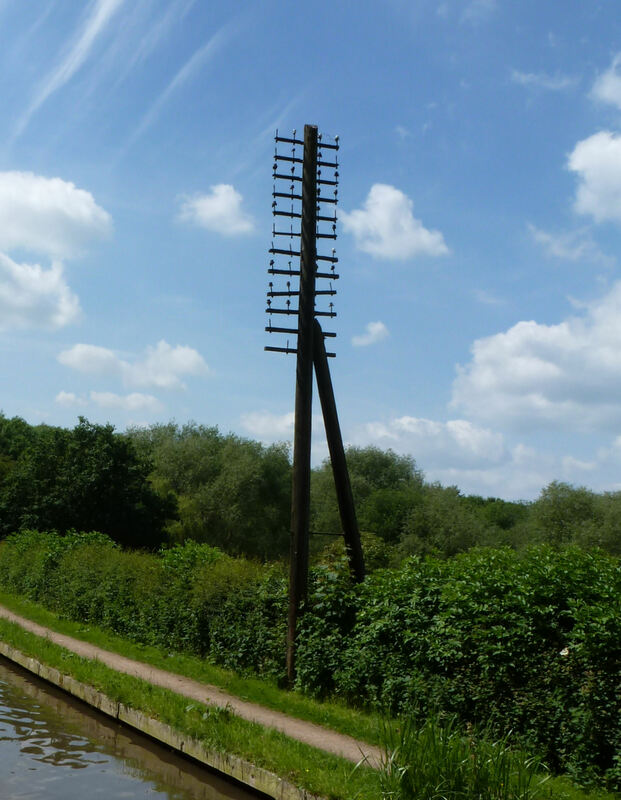 Up until 1904, only the ‘on-off’ signal could be sent so Morse code was used. That year, Professor Fleming invented the forerunner of the thermionic valve, which made radiotelephony possible. The valve or electron tube, as the American physicist who developed the concept, Lee De Forest (1873-1961) called it, receives, amplifies and transmits radio signals. By that time some 73 wireless companies had been set up in the UK and of these 64 were scheduled as either experimental or lecture installations. The Post Master General, Edward George Villiers Stanley, 17th Earl of Derby (1865-1948), submitted a Bill to Parliament requiring all wireless stations to be licensed in order for the government to maintain overall control. On 15 August 1904, the Wireless Telegraphy Act became law, remained in force until 31 July 1906, and later extended every year until the Wireless Telegraphy Act of 1924 came into force. This too was extended year on year until superseded by the 2006 Act. On 17th October 1907 between the huge Marconi stations at Clifden in Ireland and Glace Bay in America the Marconi transatlantic wireless service was inaugurated. This connected Europe with North America without cables, and opened for public use with the transmission of 10,000 words in Morse code. In 1910, the Marconi transatlantic wireless service was inaugurated. That year, on board the Montrose steamer, built at Middlesbrough in 1897 and belonging to the Canadian Pacific Company of Montreal, was murderer Dr Hawley Harvey Crippen (1862-1910) and his mistress Ethel le Neve (1883-1967). They had embarked in Antwerp travelling on false passports and she was trying to pass herself off as a boy. The Master of the ship was Captain Henry George Kendall (1874-1965) who became suspicious of the couple and sent a wireless telegram from the ship to England. Detective Chief Inspector Walter Drew (1863-1947) took a faster passage to Montreal from Liverpool and arrested the pair off Father Point in the St Lawrence river. This was the first use of wireless telegraphy to apprehend a criminal. The Montrose was brought to Dover in World War I (1914-1918) to be used as a blockship but during a gale broke free from her moorings. She was wrecked ironically on the Goodwin Sands near to one of the light vessels used by Marconi in his early experiments. 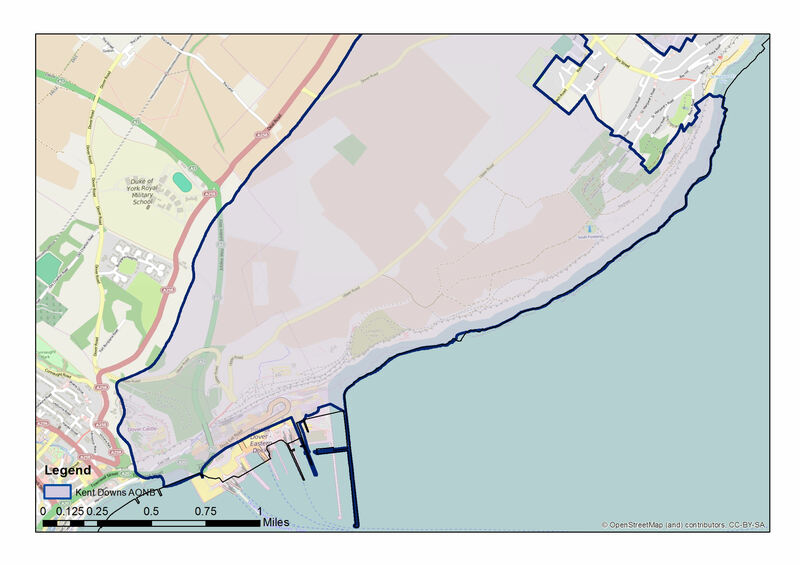 Swingate Downs, east of the Castle, now classed as A Site of Outstanding Natural Beauty (AONB), straddles across the parishes of Guston, West Cliffe and the Dover-Deal (A258) Road. Originally, it was part of the manor of Bere in West Cliffe, that was established about 1274 when Swingate was given that name. 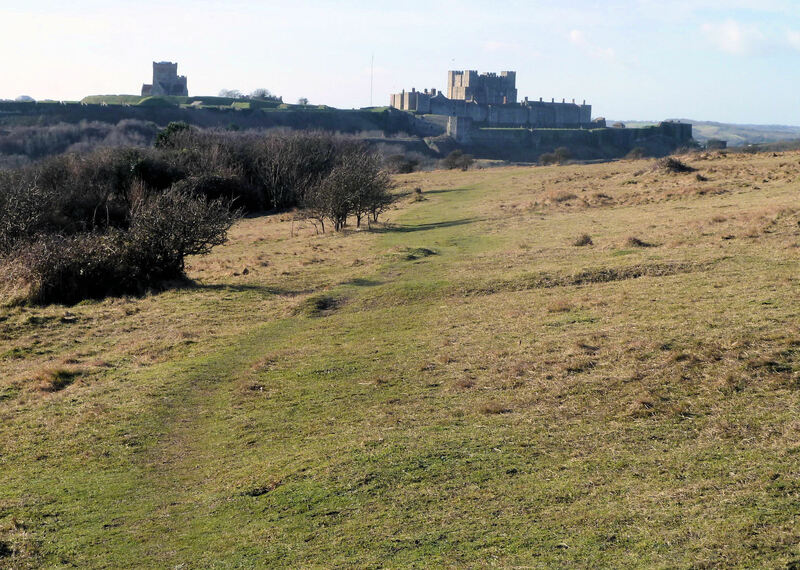 In 1797, the track from Dover to Sandwich via Deal was turnpiked into a road and the Guston turn-off, opposite the Castle, was approximately, where one of the tollhouses stood. The next one was near the present Swingate inn, where the road still kinks slightly, and the inn almost certainly developed from the tollhouse. The landward lane, once called Hangman’s Lane, opposite the Swingate inn goes to the village of Guston and along this is the Swingate Mill. Built in 1849 for miller John Mummery, it is a rare example of a tarred brick tower windmill in Kent and is Grade II listed. When built it had a projecting round house on the ground floor where the family lived. The Mummery family worked the mill up until 1936 and it was entirely wind powered. About that time or shortly after an electric motor was introduced. During World War II (1939-1945), one of the sweeps was damaged by enemy fire, the mill ceased to function and the site was used for stabling horses. In 1953 planning permission was given to change the use of the site to kennels and two years later a Kent County Council grant was sort for financial help to restore the mill but this was refused. The officer responsible had wrongly assumed that brick tower mills were common in Kent. Following this, the mill was left and it became almost derelict. In the 1980s planning permission was given for the mill to be converted into a domestic residence. In the 18th and early 19th centuries, the Dover horse races were held on Swingate Down – opposite to what later became the Duke of York’s School. 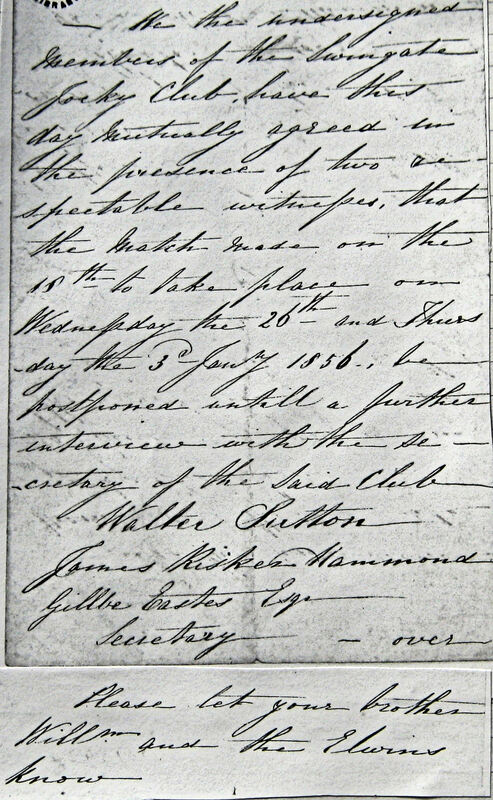 A letter circa July 1856, of which only part remains, tells of races being postponed and it is signed by Walter Sutton, James Risken Hammond and Gilbert Eastes. A postscript asks that the recipient let his brother William know and the Elwins. All those mentioned were members of Dover’s elite business community at the time. Around the time of the perceived Napoleonic threat to Britain in the late 1850s, Swingate Down, on the seaward side of the Dover-Deal Road, was taken over by the War Office. Mainly used as a field camp for brigades awaiting embarkation and the Territorial Army (TA), a couple of huts, a cookhouse and latrines were built. When the annual Volunteer Reviews were held in Dover, the Field Hospital was located at Swingate Down under the charge of a surgeon and a medical practitioner. On the morning of Sunday 25 July 1909 Louis Blériot, (1872-1936) had crossed from Sangatte, France to England in his Blériot No XI 25-horsepower monoplane. It was the first heavier than air flight and when he landed, 36 minutes 30 seconds after takeoff, it was in Northfall Meadow, on the east side of the Castle not far from Swingate. Following the historic crossing, the popularity of flying increased and a considerable amount of money was invested in developing and building aircraft. Landing places for the aircraft quickly proved a problem and airfields – in open, relatively flat, grassy areas – were sought after. 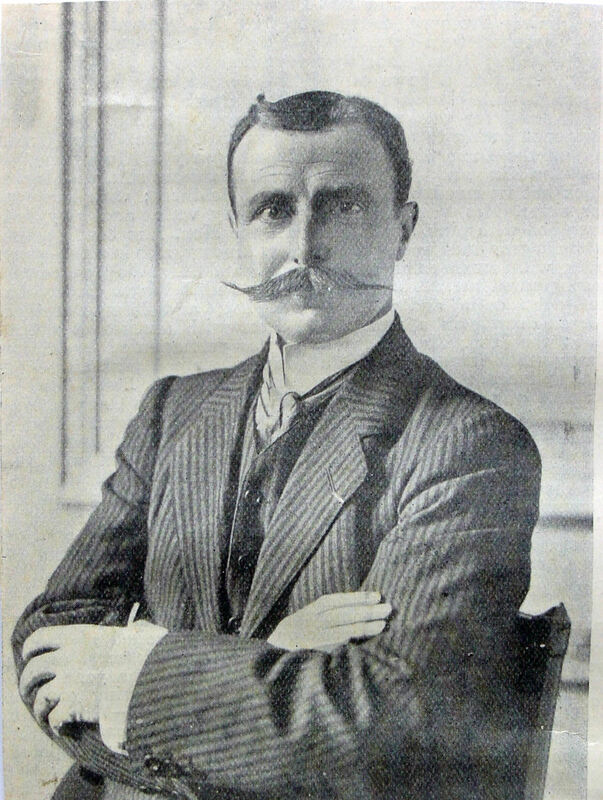 In the spring of 1910, wealthy Charles Rolls (1877-1910) saw the Swingate Down plateau as a potential airfield and persuaded the War Office to rent him the site when it was not required for military purposes. On acquiring the use of the site, Rolls had an ‘aeroplane garage’ or hangar as they are now called, erected. Built by William Harbour Ltd of St Mary Cray, they were later commissioned to build further hangars on the site (see below) and later the original Swingate Towers. On 2 June 1910, Rolls took off from the newly named Swingate aerodrome at 18.30, passed over Sangatte, France, at 19.15 and was back at 20.00 having made the first two-way Channel crossing in an aeroplane. 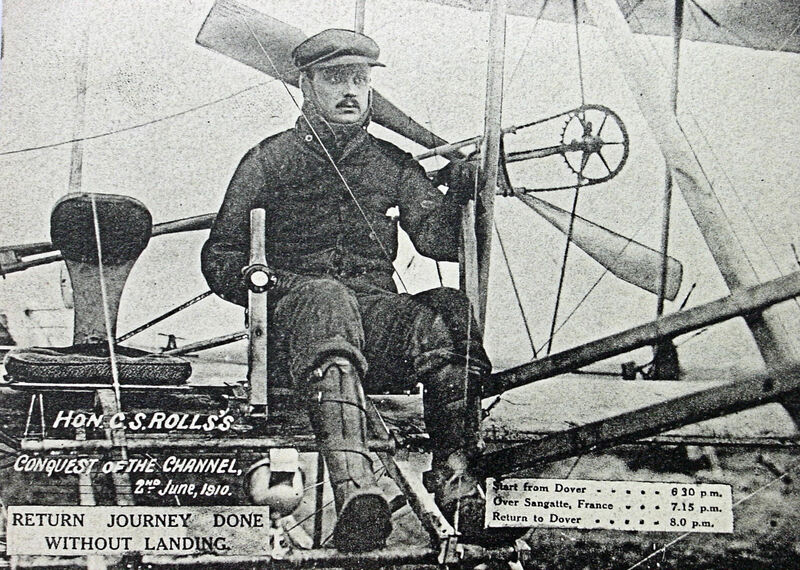 Sadly, a month later, on 12 July, Charles Rolls was killed in an aeronautic accident. Nonetheless, the interest in flying continued to grow and more hangars were built. On 7 December 1910, a group of aviators gathered at Swingate before attempting to try to win the Maurice Arnold de Forest (1879-1968) prize of £4,000. This was for the aviator who flew the furthest in an English-built aeroplane by 31 December 1910, having first crossed the Channel. The pilots taking part from Swingate included Claude Grahame-White (1879-1959), Robert Loraine (1876-1935) – who first named the aircraft control stick a ‘joystick‘ – and Cecil Grace (1880-1910). The weather was against them and continued to worsen such that ten days later, a southwesterly gale reaching a velocity of 75 miles per hour smashed one of the hangars destroying a biplane. On 18 December the weather conditions were ideal and from the recently opened Royal Naval Air Station at Eastchurch on the Isle of Sheppey, north Kent, Thomas Sopwith (1888-1989), successfully flew 177 miles to Beaumont, Belgium. Claude Grahame-White set off from Swingate in a Bristol biplane equipped with a 60 horse-powered E.N.V. engine – an acronym for V8 engines made by the London and Parisian Motor Co. He rose easily from the ground and then suddenly the biplane heeled over and crashed. As medical equipment was on site this was prepared but was not required as Grahame-White managed to crawl out from underneath the wreckage having sustained nothing more than a bloody nose. The weather augured well on 22 December and several aviators took off from Swingate including Cecil Grace. Tommy Sopwith had arrived at the airfield the day before with his biplane to have another go if anyone beat his record. Grace was one of the first to leave, at 09.26hrs in his Short 7 biplane. There was a light wind from the west but there was mist over the sea. In case of accidents, in the Channel were two Calais steam tugs and one from Dover. The Dover lifeboat was standing by. On the other side of the Channel fog was rolling in and Grace eventually landed at Les Baraques, near Sangatte. At 14.10hrs, Grace filled his biplane with enough petrol to fly for 4-5hours and started on his return flight to Swingate. An hour later anxiety was being expressed as he had not arrived and by 17.00hrs search vessels were patrolling the fog-enveloped Channel. A general wireless call was made to all the coastguard stations and light houses/vessels informing them of Grace’s disappearance. As time past the most optimistic were saying that Grace had been wearing a cork-lined coat, so even if he had come down in the sea and the plane sank, he would keep afloat but nothing was heard of him. On 6 January 1911, pilot’s goggles and a cap was found on the beach at Mariakerke, in Belgium. They were later identified as belonging to Cecil Grace. At the time of the competition, political tensions were mounting across Europe and in 1912, the number of military exercises had increased such that Swingate was hardly used as an aerodrome. On 14 October 1912, a 450-foot (approx.150 metres) long Zeppelin paid a clandestine visit to north Kent. Shortly after the Admiralty made £45,000 available to create a temporary-flying depot on Swingate Down. This was formally agreed in 1913 but under the auspices of the Army and three large hangars were erected. In Parliament, a Select Committee agreed to approve an agreement with the Marconi Wireless Telegraph Company for a series of wireless stations throughout England, also in Egypt, East Africa Protectorate (now Kenya), South Africa, India, and Singapore or in the neighbouring part of the Malay Peninsula. The Royal Flying Corps had formed in 1912 and was made up of a military wing and a naval wing with a central flying school at Upavon, Wiltshire. In June 1913, as a preparation for the impending War, Guilford Battery, on the seafront, and the surrounding grounds were requisitioned for the Royal Naval Seaplane Patrol. This was part of the Naval wing of the RFC which on 1 July 1914 became the Royal Naval Air Service and during the War the Seaplane Patrol worked closely with the Dover Patrol. The RFC military wing retained the name Royal Flying Corps (RFC) until 1 August 1915 when it was officially separated from the Army. In the final year of the War, on 1 April 1918, the Royal Naval Air Squadron and the RFC merged to form the Royal Air Force (RAF). In November, 1913 as many as 400 people walked up to Swingate to watch the Royal Flying Corps practice on aeroplanes especially brought in from elsewhere. Land at Swingate and an airfield at Capel were commandeered by the RFC. The Swingate land was to be converted into an airfield for military purposes and in 1915 Capel aerodrome was classified as an RNAS airship station and small airships (Blimps) were based there. A few weeks before, at the Duke of York’s school, near Swingate, Lieutenants Anderson Gill of the RFC 5th Squadron and other members of the Corps flew Maurice Farman biplanes gave an impromptu show of exhibition of flying to an altitude of 4,000 feet. All the engines were 80-horsepower Gnomes. This was much to the delight of the crowd but as the planes landed the crowd surged onto the field. Mounted military police and mechanics soon restored order and kept the crowd back. The highlight of the afternoon was when Lieutenant Stopforth took Duke of York’s pupil, Sergi Mott for a flight in one of the Maurice Farman biplanes. When the plane reached an altitude that the occupants could just be still seen by the crowd, Lieutenant Stopforth switched the engine off. Making a ‘splendid spiral descent the plane was landed in a graceful style.’ The young Sergi said that he enjoyed the flight! On 2 August 1914, two days before the outbreak of World War I, the first aeroplanes arrived at Swingate, or St Margaret’s aerodrome, as it was officially named. 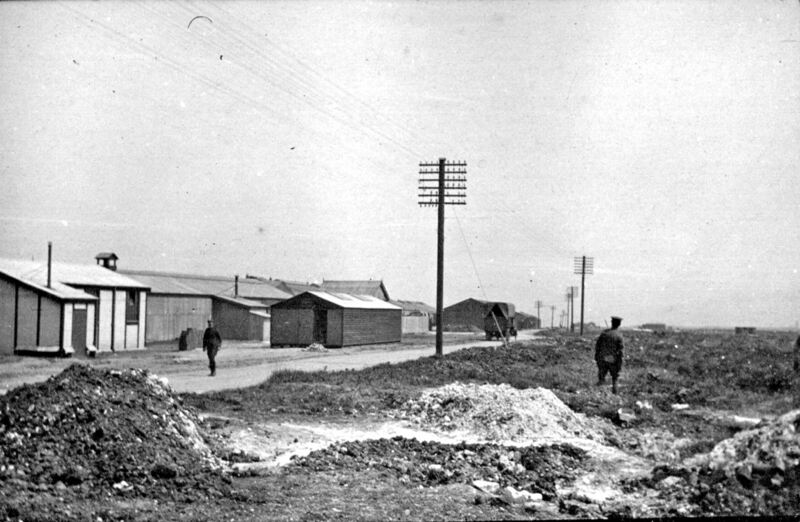 The airfield was the base of the first Royal Flying Corps (RFC) squadrons that were being sent to the Western Front. The RFC had been formed by the Air Battalion of the Royal Engineers and was under the control of the military. At the beginning of the War the planes did not possess any armaments, other than revolvers and automatic pistols carried by the pilot. 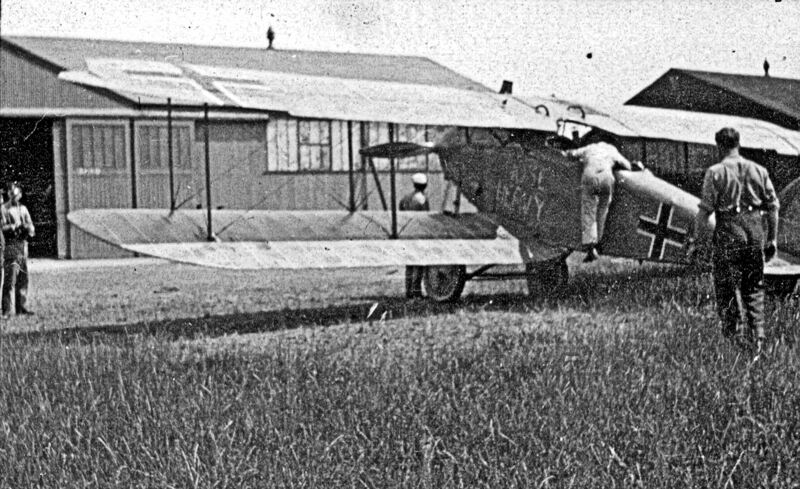 The first RFC aircraft to land in France was a BE 2A of 2 Squadron flown by Lt H S Harvey-Kelly, which had taken off from Swingate for Amiens in France, at 06.25hrs on 3 August. By Monday 10 August 1914, some fourteen hangars had been erected at Swingate and there was a large assembly of aeroplanes with fresh arrivals every hour. On Thursday 13 August, the aeroplanes were leaving at intervals of about one minute. In total four squadrons – 56 machines – flew from the aerodrome to Amiens between 13 and 15 August 1914. From there they flew to Maubeuge as part of the British Expeditionary Force. These squadrons played their part in the retreat from Mons but sustained heavy casualties. At about this time a series of trenches and redoubts were constructed as part of the Fortress Dover defences. From aerial photographs, held by the Imperial War Museum and taken later on in the War, three redoubts were constructed at Swingate. On nearby Northfall, meadow RFC accommodation huts were erected and Connaught Barracks were built nearby. Between Fort Burgoyne and the Duke of York’s school, tin huts (later called Tin Town) were erected as accommodation for the Royal Naval Air Service to defend the Admiralty Harbour. The RFC quickly proved their worth in air reconnaissance. Particularly, halting the German advance in France and providing information on exposed flanks and weak points in the German lines. As the War progressed, satellite airfields related to Swingate, were laid including Guston airfield – between the Duke of York’s school and Swingate windmill. Before the War, a wireless time signal was transmitted every evening from the Eiffel Tower in Paris. This was the only regular broadcasting service in the world and only those with Marconi sets could receive it. As the War progressed, official wireless telegraphy increased but this was in cipher and sent by Morse code. 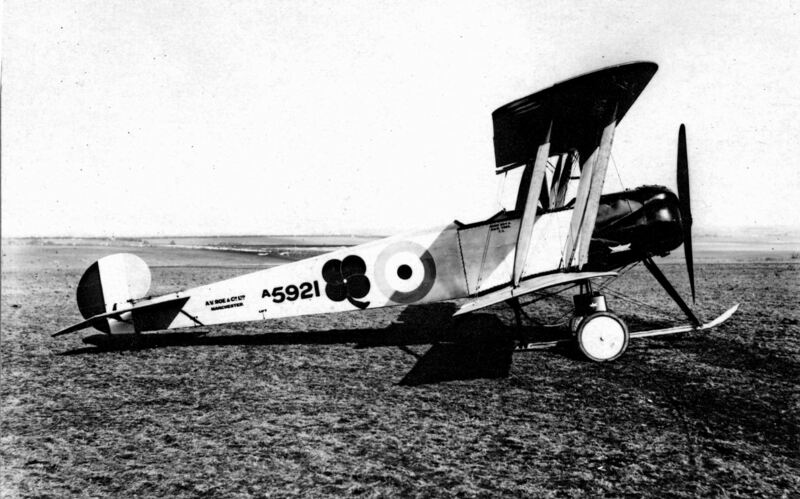 To help reconnaissance, by early 1915 two-seater aircraft were equipped with a radio transmitter but no receiver so artillery batteries were required to communicate with aircraft by laying strips of white cloth on the ground in prearranged patterns. Besides reconnaissance, the RFC pilots physically dropped small bombs on strategic targets. The German military had realised the value of aviation before the War began and by the outbreak, formed the Brieftauben Abteilung Ostende – Ostend carrier pigeon detachment. Their first bombing raid was over the English Channel on 24 December 1914. At 11.00hrs, the first aerial bomb to be dropped on the United Kingdom landed in a garden near Taswell Street. Lt. Von Prondzynski had flown the Taube aircraft and was aiming to drop his bomb on the Castle. The blast broke an adjoining window and threw the St James Rectory gardener, James Banks, out of a tree! Thankfully, he was only slightly injured. There is a Dover Society plaque commemorating the event, nearby. The German aircraft was chased by two aeroplanes from Swingate, the pilots of which were only armed with pistols. Lieutenant Alfred von Prondzynski managed to evade them and when he returned to Germany was given a heros welcome. This was one of the rare occurrences of an aeroplane attack in the early part of the War; the Germans preferring the less flimsy Zeppelins that could carry much large bombs than the hand thrown bombs carried in aeroplanes. A Zeppelin approached Dover in the early hours of 17 May 1915 dropping a large number of incendiary bombs in fields between Swingate and Martin Mill. When it came under fire, it made off across the Channel but near Dunkirk it was attacked by a British aircraft when the pilot dropped a bomb on the Zeppelin. The German pilot managed to get his machine to Brussels but not before it had come under attack from more bombs thrown by British aviators. On 10 August 1915 a Zeppelin, bombed the harbour near the western entrance killing one sailor and injuring three. Fifteen days later saw another Zeppelin attack but there were no casualties. On 23 September the Commander of the Dover Patrol, Admiral Sir Reginald Hugh Spencer Bacon, (1863–1947), welcomed George V (1910-1936) and showed the King round Admiralty harbour, the Seaplane depot at Mote Bulwark, and the Swingate and Capel aerodromes. During that day, the prospect of using planes as part of the offensive were discussed particularly in the light of the continual attacks by Zeppelins, seaplanes and aeroplanes on shipping and Dover. At the time aircraft design was changing with the combat role of aviators in mind. Initially the engine and propeller of the aircraft were moved behind the pilot and machine guns were fitted in front of him, so that he had a clear view of his foe. Called the pusher design, it slowed the aircraft down making it virtually useless in combat. On 23 January 1916, there was a seaplane raid on Dover during the moonlit night and eight bombs were dropped. One person was killed and several injured. At lunchtime on the following day two seaplanes attacked the town. On the afternoon of Sunday 19 March, another two seaplanes attacked the town. This time seven people were killed and a good many more injured. Throughout the spring and summer that year, the attacks continued and the number of fatalities and injured continued to rise. During the late evening of 24 August 1916, a Zeppelin attacked the South East Coast that headed away when it came under attack from land forces. One of the Swingate BE2 type aircraft pursued the Zeppelin for an hour then lost it in cloud. Besides adequate air defence, it was recognised that some form of early warning system was needed to counter the continuing raids. At Binbury Castle near Maidstone, Kent in July 1915, a 16-foot sound mirror was cut into the chalk face by Professor Mather who claimed that it could detect aircraft from 20 miles away. The mirror was hemispherical and the sound collector was mounted on a pivot at the focal point. This was a trumpet shaped cone and the listener, who wore a stethoscope like instrument, moved the sound collector across the face of the mirror listening with the instrument until he found the point where the sound was loudest. Bearings to the target could then be read from vertical and horizontal scales on the collector. Sound Mirrors were constructed along the south and east coast and the Thames estuary. Locally some can still be seen along the cliffs; one was erected in Fan Bay, below Swingate. It was believed that the Second Sound Mirror was a later version but it is now believed that both were erected during World War I. Eventually, the problems of enabling aviators to take a more active role in combat were sorted out and the Handley Page bomb-dropper was built. Not long after, one was captured by the Germans who adapted it to what became the Gotha three-seater. The bomb-droppers carried about one-third of a ton of bombs and the size had been increased from the hand thrown 20lbs bombs to 110lbs. The shape of the bombs was redesigned so that they fell straight down and with increasing speed affording them more penetrative power. Attacks became part of the aviators’ job but the average life expectancy for a British pilot by this time was only 93 flying hours. Besides mechanical failure and being shot down another potentially fatal factor was the weather. Many RFC aircraft were lost due to thunderstorms and poor visibility. As Zeppelins were vulnerable to aeroplane attacks, they were slowly phased out and replaced by aeroplanes. In March 1917, the Germans falsely claimed that Dover Gas Works had been destroyed. Land and air defences were keeping such attacks to a minimum and for those planes that did get through, the aim was to capture them. Planes shot down were taken to Swingate for examination. Towns along the coast to the west of Dover, however, had no such protection and up until 1917 only occasionally required it. On Friday 25 May 1917, the Germans sent a squadron of about 16 aeroplanes for a raid on Essex airfields but due to heavy cloud, they turned south. The sky cleared when they were just north of Folkestone and they dropped their loads over the town. Tontine Street was crowded with shoppers and 71 people – 16 men, 28 women and 27 children – were killed. Those injured amounted to more than 94. On 6 April 1917, the USA declared war on Germany. More billet huts were erected on Northfall Meadow and the adjacent Edinburgh Hill for American pilots, who had taken over Swingate aerodrome although British planes still operated from the site. On Monday 28 January 1918 at 19.45hrs German planes and immediately the British ‘Bristol Fighters,’ prepared for take off from Swingate. As the raiders returned from London following the South Eastern and Chatham Railway Line as far as Shepherdswell and then making towards Belgium where two pilot searchlights were shown as guides, they were attacked by patrols from Swingate. There was another raid the next night, and the Dover guns were in action with the raiders at 00.50hrs. This time the raiders were met with heavy gunfire and airplanes from Dover, however, on 16 February at 21.35hrs and enemy aircraft dropped 23 heavy bombs at St Margaret’s. There a good deal of damage to property was done but no one was killed or injured. On 20 May 1918, about six bombs were dropped on the Aerodrome but did little damage. 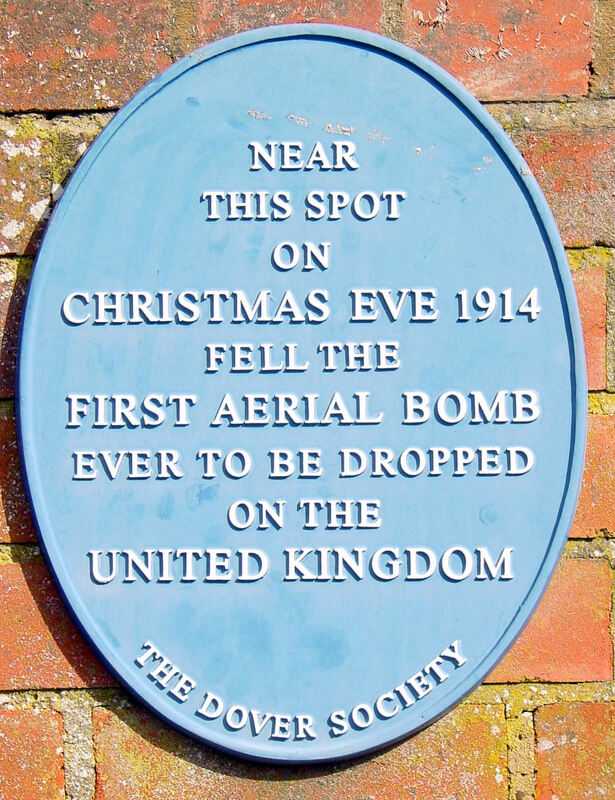 They were the last bombs dropped on England in World War I. Following the end of hostilities, the American’s vacated Swingate and aircraft spares were stored in the hangars. The Royal Air Force (RAF) was formed on 1 April 1918 by the amalgamation of the Royal Flying Corps and the Royal Naval Air Service. A year later Swingate aerodrome was returned to the Army and site reverted to its pre-war military training role particularly for the TAs. The hangars remained, inside which were parts for aircraft and the machinery for making repairs in case aeroplanes in trouble landed at Swingate. A memorial was erected in 1966 on Upper Road, commemorating the four squadrons of the Royal Flying Corps contingent of the British Expeditionary Force, who flew from Swingate to Amiens between 13 and 15 August 1914. At the 1924 summer camp, the TA’s along with the 1st Royal Warwickshire Regiment, the 12th Infantry Brigade and three battalions stationed at the Dover barracks, one of which belonged to the Signal Corps, undertook training from RAF personnel. A Bristol fighter aeroplane was used to give a demonstration in height testing using various lights and over the following few days, the soldiers were taught the various methods of transmitting and receiving wireless signals. However, the wireless training was not met with full approval from the top brass, as they felt that the TA’s time would have been better spent on sports activities. As for the Signal Corps, it was stated that their job was as motorbike despatch riders, along with setting up and operating cable communications. Cables were carried on carts pulled by horses or tractors. World War I had thrown up a number of issues that hitherto were of no account. One of these was the sanitary arrangement within the trenches where disease had taken its toll of the combatants. In 1925, a small Sanitary Company was set up and based at Swingate under Captain S Summerton. Initially the tiny unit advised on sanitary arrangements within its own 4th London Infantry Brigade, but soon other divisions showed interest and they provided training at Swingate for them. Later that year the 47th Division of Signals ‘not afflicted with the wireless craze’ erected a transmitter on the back of a lorry at Swingate, to serve purely ‘as a land mark.’ Albeit, military officials at the Castle admitted that the transmitter/receiver did keep units of the 47th Division, then stationed in the Dover area, in touch with each other. Morse code was used for communication. In what was hoped to be a ground-breaking experiment, Col. Brown worked with Colonel J Waley Cohen, Deputy Chief Signals Officer, TA Eastern Command. Both Colonels had served in the Army during World War I and Whaley Cohen, who had been involved in the formation of the RAF, had a keen interest in telecommunications. In 1924, the War Office authorised the formation of specialist Royal Signals units of the Supplementary Reserve that were to provide ground communications for the RAF on exercise and overseas. It was these men that took part in an exercise to compare and contrast cable and wireless communication on manoeuvres. A mobile radio-telegraphy station supplied by RAF Manston, in Thanet, supplemented their equipment. They were also going to send the 13th Squadron but weather conditions prevented this. During the night it rained and by early morning it was heavier and distant thunder claps were heard. The TA infantry brigades were divided into two and set off in the early hours of the morning from Swingate to a pre-arranged location. One company was to use narrow country lanes and cart tracks, the other to go across fields. Each company had wagons carrying cables, batteries and associated equipment and on separate wagons, a Watt’s wireless transmitter/receiver, aerials, batteries and associated equipment. All the equipment was drawn by horses and tractors and accompanying them were dispatch riders in case of problems. There were two Signal officers in charge of the two individual cable units but only one specialist in wireless operation and therefore he was in charge of both wireless units but he did have men in both units, who had undergone wireless training, to help him. The unit travelling along the lanes arrived at the designated destination with little problem. They set up camp and signals, using the cables and the wireless, were dispatched more or less simultaneously. There was little difference in the time taken to make the communication and receive acknowledgement. The wireless section of the unit travelling across the fields arrived earlier than the cable section. Due to the weight of the cables, the latter were frequently bogged down. The actual time taken to set up and make the transmissions were similar and Colonel Waley Cohen was particularly pleased with the result of the first part of the experiment. The day before, cable and wireless apparatus had been set up at the predetermined destination. The second part of the experiment was for the two units to dismantle the equipment they had erected and return with it to Swingate, having left the cable and wireless operators unit at the predetermined location to use the equipment set up the previous day. The unit that travelled outwards by lane returned across fields and visa versa. The weather continued to deteriorate and the two cable groups took considerably longer to return to Swingate. The wireless group travelling by the lanes arrived first and not long after those who came across fields. However, on arrival at Swingate there was a full blown storm and the lightning so badly affected the wireless communication that the conclusion was not to use it in the field. During the 1920s, the number of private aircraft had increased significantly. Swingate became an important stop over during bad weather, when manoeuvres were not taking place. In the spring of 1929, a number of aviators were attempting to fly from London to Shanghai, China and the first stop was to be Amsterdam, Netherlands. However, bad weather forced a number to land at Swingate where they found the former airfield overgrown and deeply rutted by heavy vehicles. The hangars were still standing but the spare parts for planes and the tools had gone. The aviators left as soon as they could and reported on the poor state of what was still referred to as Swingate aerodrome. It was a beautiful summer’s day on Thursday 25 July 1929 when Louis Blériot flew across the Channel to mark his momentous crossing of 20 years before. On this occasion, Blériot piloted a twin-engined bomber monoplane on loan by the French Air Force. The flight had taken 12 minutes whereas in 1909 it had taken 33 minutes and he had been escorted by Air Vice-Marshal Sir Sefton Branker (1877-1930), flying his own plane and nine RAF aircraft. They all landed at Swingate aerodrome, which had been rolled and mowed for the occasion. Blériot was then driven to Northfall Meadow where he had landed following the historic flight and there he was greeted by the Mayor of Dover Alderman H E Russell, and the Corporation. Mdm. Blériot, who had been flown to Lympne airfield in a French Golden Ray machine and driven to Dover, arrived shortly after. Blériot inspected the commemoration stone and then left for Croydon aerodrome, where the long flat roofs of the Terminal buildings and hotel were crowded with spectators. At Croydon, he was met by Christopher Birdwood Thomson, 1st Baron Thomson (1875-1930) the Secretary of State for Air and other prominent figures in British aviation. Blériot returned to Swingate on 3 August 1929, escorted by two RAF aeroplanes but it was only a middle ranking army officer, stationed at the Castle, who met him. The party inspected the airfield and looked into each of the hangars and, as Blériot had been led to believe by the London-Shanghai aviators, they were all empty. The army officer showing Blériot around also noted the empty aircraft hangars and later suggested to his superiors an alternative use for them. It rained throughout the TA summer camp that year and the empty hangars were used for demonstrations and lecture purposes. This proved so successful that the military in London confirmed that in future the hangars were to be used for military training purposes. In Wales, Sir Alan Cobham (1894-1973) owner of National Flying Services Limited, approached the civil authorities in Cardiff, Newport and Swansea suggesting that they opened municipal aerodromes. His idea was received favourably by Cardiff council where the Splott Tide Field was seen as the ideal location pending Sir Alan’s approval. Ten days after Blériot’s second visit, on 13 August 1929 – another rainy day – Sir Alan flew into Swingate accompanied by two of his other aircraft. They were met by Mayor Russell, members of Dover Corporation and senior Army and RAF officials. They viewed the poor state of the airfield and Sir Alan gave the Mayor and those who wished trial flights. As the weather closed in, the party escaped into one of the hangars and discussed the possibility of turning Swingate into a municipal aerodrome. At the following full council meeting, Dover Corporation declined to consider the possibility of a municipal or RAF aerodrome at Dover. This entry was posted in Aviation, Marconi Wireless and Swingate Aerodrome, Marconi Wireless and Swingate Aerodrome, Open Spaces, Part I - Marconi, Radio and Telecommunications, Swingate, Wireless and Swingate Aerodrome, World War I. Bookmark the permalink.